Hoopsie Daisy teaches fun, high-energy classes full of laughter! She emphasizes the importance of feeling confident and radiant while hooping, and she draws on her extensive dance background to provide articulate and accessible instruction. Her goal is to help all of her students achieve hoop bliss! 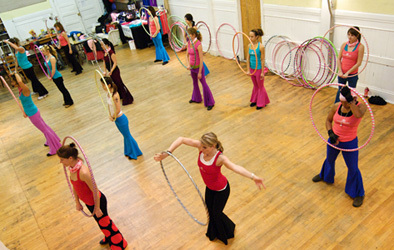 Hoopdance for beginners is an introductory class for all ages, genders, and body types - no previous experience is necessary! Even if you were never able to hoop as a child, these adult-sized hoops with grippy tape will stick to your hips - give hooping another spin! This class will cover the basics of hooping on the torso, arms, and legs, as well as off body hooping, jumps, and floor work. 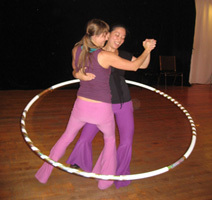 Intermediate hoopdance builds upon the basics, focusing on transitions, combining moves, and learning more complex skills. Smooth out and improve the skills you already have while you expand your hoop vocabulary with challenging new moves including shoulder and leg hooping variations! Advanced hoopdance will make you the best hooper you can possibly be! This class will push you to new heights with more combinations and show stopping tricks. 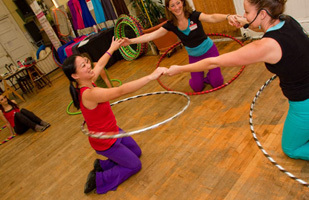 Special workshops are offered for partner hooping (two people in one hoop), double hooping (one person with two hoops), leg hooping skills, LED hooping, and performance skills. Private lessons are available for individuals or small groups, which provides a personalized curriculum tailored to your needs as well as one on one instruction. Please wear comfortable stretchy clothes such as tank tops and yoga pants. Bring lots of water because you will sweat! Class size is extremely limited in order to provide individual attention to each student.